In the past couple of years, as studies have come out sounding the alarm on the ill-effects of excessive sitting, the popularity of standing or stand-up desks has soared. Those who have read much of the coverage of this trend might be forgiven for thinking that standing to work constitutes a new hip fad. But as it is with many things, everything old is new again. 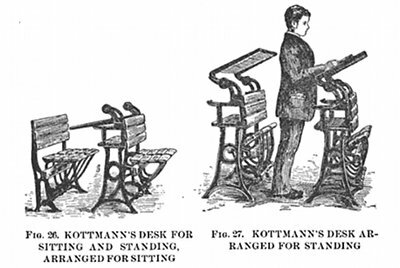 For the stand-up desk was cool long before the cats in Silicon Valley got hip to them. They’ve actually been a secret of great men for centuries. Today we’ll explore the standing desk’s place in history, discuss the benefits of using one, and outline how you can rediscover this old/new tradition. 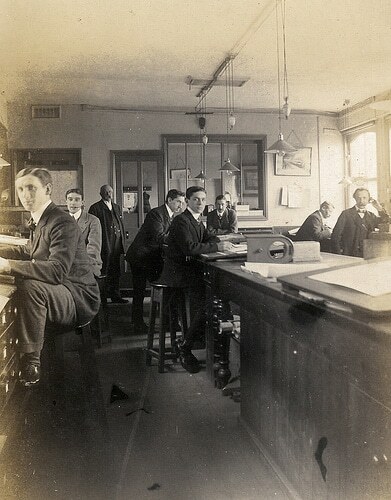 Offices in the 19th century often had communal sitting/standing desks as opposed to individual desks for each employee. 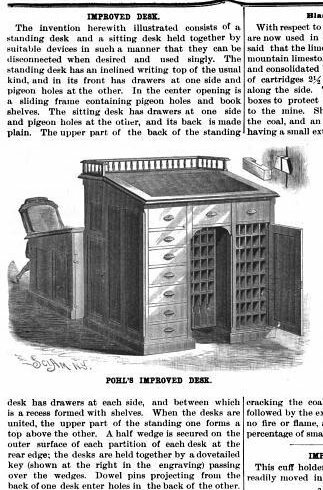 Searching the historical record, and by historical record I mean Google Books, you’ll find mentions of the standing desk in a variety of places. Thomas Jefferson is perhaps the most famous user of the stand-up desk. His six-legged “tall desk” had an adjustable slanted top that was large enough to place a folio. Jefferson used the desk to draw up brilliant architectural blueprints for buildings like the Virginia State Capitol. Jefferson was not the only head of state to favor the standing desk. Prussian Prime Minister Otto von Bismarck would be standing at his desk by five in the morning, ready to sort through all the proposals and business of the day. When Winston Churchill was not lounging in bed, he liked to lay out the galley proofs of his next book on an upright desk and pore over them, looking for needed corrections. 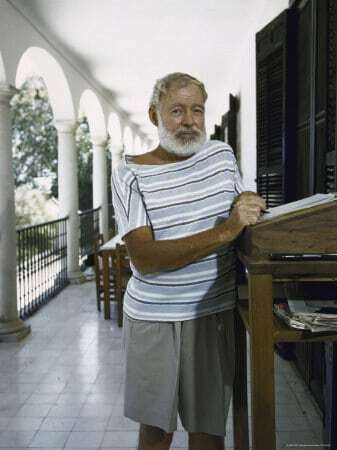 Hemingway working on the porch of friend Bill Davis’ house in Malaga, Spain. 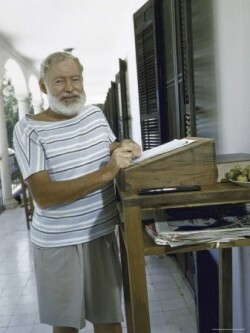 Davis provided the desk for Hemingway. Excessive sitting is slowly killing you. I know. It seems like hyperbole. But it’s not. A study found that men who sit for more than six hours of their leisure time each day had a 20% higher death rate than those who sat for three hours or less. The epidemiologist who conducted the study, Alpha Patel, concluded that excessive sitting literally shortens a person’s life by several years. Another study showed that men who sat for 23 or more hours a week had a 64% greater chance of dying from heart disease than those who sat for 11 hours per week or less. So why is sitting so frighteningly bad for you? Well sitting is the ultimate passive activity; you burn more calories chewing gum than you do slouching in your chair. When you sit, the electrical activity in your muscles flat lines, and your body uses very little energy. Powering down your body like that for long periods of time leads to a cascade of negative effects. Your heart rate, calorie burn, insulin effectiveness, and levels of good cholesterol all drop. Your body also stops producing lipoprotein lipase and other molecules that are only released when you flex your muscles, such as when you are standing and walking. These molecules play an important role in processing fats and sugars; without them, your metabolism suffers. Add these factors up, and it’s no wonder that those who sit for long periods of time each day have larger waistlines and worse blood sugar and blood pressure profiles and are at higher risk of heart disease, diabetes, obesity, and cancer than who sit less. And if you think you’re off the hook because you get in a bout of vigorous exercise each day…you’re not. Studies have shown that exercise does not counteract the negative effects of sitting. It’s like thinking you can snack on Twinkies all day, and then offset that by running for an hour. As mentioned above, when you sit, your heart rate and calorie burn go down. Health experts will tell you that weight gain typically creeps on gradually from consuming a few too many calories here and there, and slowing down in small ways as we age. We just keeping putting on a couple of pounds each year until a decade goes by and suddenly we’re tubby. I did a test with my heart rate monitor and found that my heart rate was 10 beats higher when I was standing than sitting, and I burned 54 calories in an hour of sitting as opposed to 72 in an hour of standing. That doesn’t seem like much, but if you sub in four hours of standing for four hours of sitting a day, that could translate to 7 lbs a year! When I go to the gym I see all these middle-aged guys lying on the floor and contorting their bodies into weird stretches in an attempt to alleviate their chronic back pain. These aren’t blue-collar men who’ve strained their back from years of heavy labor; no, they are white collar guys whose pain stems from not using their backs enough. Years of slouching in a chair has taken a toll. Standing up engages your back muscles and improves your posture. Many folks who have made the switch to a stand-up desk have reported that the change cured their back pain. Standing up can increase your focus in several ways. First, you don’t get that sleepy feeling where you desperately want to put your head down on the desk and pass out; your muscles are engaged and you’re less comfortable, so you stay alert. And second, it lets you be more active so you can release your restless energy. You can move around more, shift from one leg to another, and start pacing around whenever you’d like. And perhaps there’s something to be said for the argument one hears from creative-types that standing increases your blood flow, thus keeping your brain juiced for inspiration. While you get less sleepy while working standing up, at the same time you gain a satisfying overall tiredness by the end of the day. I hate going to bed feeling like my body hasn’t done a damn thing all day. When you stand up while you work, you earn that satisfying body-used feeling, and at night you fall asleep fast into a restful snooze. 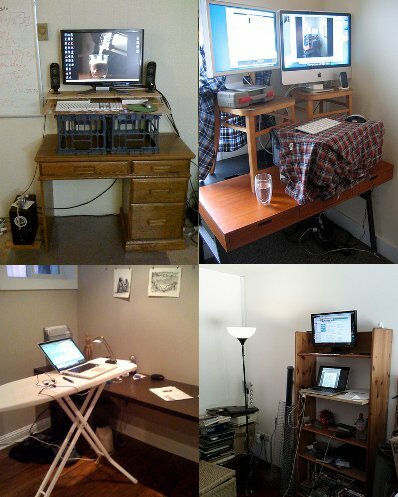 So you’re sold on the whole standing desk thing. How do you get started? Luckily, you need not have $800 to drop on a new desk if you want to start standing up while you work. The options for jerry-rigging a stand-up desk are limited only by your imagination, and the tolerance levels of others for your potential eyesore of a creation. I use a kitchen counter that’s about the right height for working. And I also frequent a coffee shop that has a high table that can be used with stools or for standing up. In my old place, I stacked together a bunch of large books and placed my computer on top. You can also raise your whole desk by placing it on top of cinder blocks or milk crates. Or you can set a coffee table on top of your current desk. The options for jerry rigging a stand-up desk are limitless, albeit ugly. And you don’t even have to start with a desk at all. You can stack together some plastic storage tubs or boxes, or use a book shelf or even an ironing board. Folks have also had luck with modifying IKEA furniture to their purposes. Of course the third option is to build the desk yourself. I’m going to be doing just that, documenting it, and sharing how I did it with you guys once I’m done. If you work in an office, some or all of these options may not be viable. You can talk to your boss about getting a different desk. And you can always stand up to surf the web and such when you get home. I personally like to pace around while reading my Kindle. Excessive sitting isn’t healthy, but standing all day long in the same place isn’t the best thing for you either. Ideally, you want to move around and change positions throughout the day, standing sometimes, then sitting, then pacing, and so on. 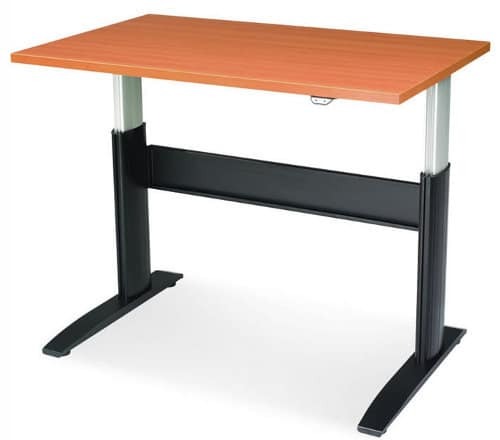 So keep that in mind when buying or making a desk; get an adjustable one so you can both stand and sit, or have a place to sit near your upright desk (or use a stool). You might consider getting just a podium to place next to your regular desk. For the best ergonomic positioning, create a stand-up set-up that puts your arms at about 90 degrees while you type. Standing up while you work will take some getting used to. At first it will seem tiring, but as you continue to do it, your body adapts, and you’ll be able to stand for longer and longer periods of time. You might also consider getting a soft pad to stand on to give your dew beaters some extra cushioning. So get to work like Jefferson, and soon people will be saying that you’re a real stand-up guy!